The monastic community’s annual three-month Winter Retreat will take place from the beginning of January to the end of March. This is a time for the Sangha to put many activities down and have an extended period reserved for formal meditation practice. Nevertheless, the meal offering will be the same as usual: every day at 11 a.m. And anyone is welcome to come to the monastery to offer food to the Sangha and share in the meal as well. However, there won't be Sunday afternoon workshops for the duration of the retreat, and we won’t be accepting overnight visitors in the usual way. During January, February, and March, several laypeople stay at the monastery in order to support the monastic community’s retreat. We currently have a crew of volunteers who have committed to helping out in this way, but it would be helpful to have one or two more. It’s important that these people are already known to the community and that they are familiar with the monastery from at least one previous, overnight visit of several days. Ideally they will be able to stay for the full three months (or at minimum for one of the months). They would join in most of the group practice periods and there will likely be much unstructured solitary time to use to further one’s practice. Therefore they should be experienced in staying in a silent retreat atmosphere, and comfortable with solitude. This year’s Vassa, or Rains Retreat, is coming to a close on October 24. An annual three-month period of stability for Buddhist monks and nuns for over 2,500 years, the Vassa marked the monsoon time when the typical wandering of samanas (renunciant monks and nuns) from place to place would become impractical and risk damaging the rainy season crops. Since then, as the Sangha (the Buddhist monastic community) has become rooted in different countries and climes, the Vassa has remained a time of stability in Theravada Buddhist monasteries, with the resident community remaining in place for the three months between the full moons of what is usually July through October. This year at Temple the resident sangha has included Ajahn Sucitto – or Luang Por, as elder monks in the Thai tradition are often called – who will be moving onwards after our Kathina on November 4 (which, by coincidence, will also be his birthday). Luang Por will offer a Dhamma Talk at around 1pm on that day as part of the occasion. We’ve also had the pleasure of Ajahn Anando’s company since he arrived from Amaravati in April; he has been mostly on retreat during his stay this year at Temple, and we have been making arrangements to apply for a long-term visa so that he’ll be able to rejoin the community indefinitely. Ajahn Suvijano, from Thailand, has similarly been with us for a another six-month stint, and we hope also that he will be able to return next year. 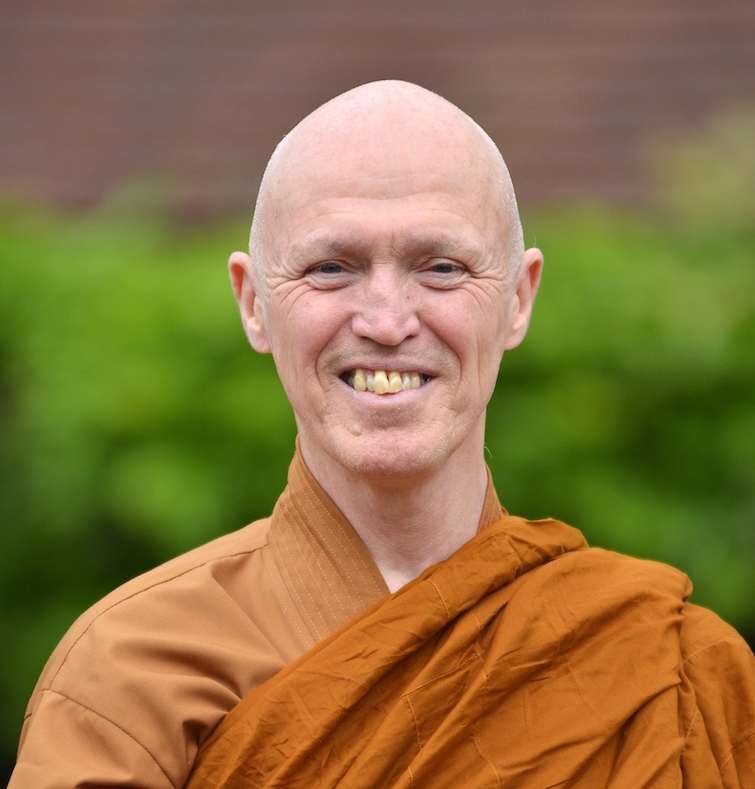 And a further addition to the sangha this year has been Ajahn Pasadiko, an American monk who’s trained at our monasteries in Thailand for the past twenty years. With the departure of two anagarikas (Nathan and John) and the addition of another (Andy), the sangha at Temple for the vassa of 2018/2561 has been: Ajahn Sucitto, Aj. Jayanto, Aj. Anando, Aj. Pasadiko, Aj. Caganando, Aj. Kumaro, Aj. Jivako, Aj. Suvijano, Ven. Sunyo, Ven. Candapanyo, Ven. Santi, Samanera Jino, and Anagarika Andy. 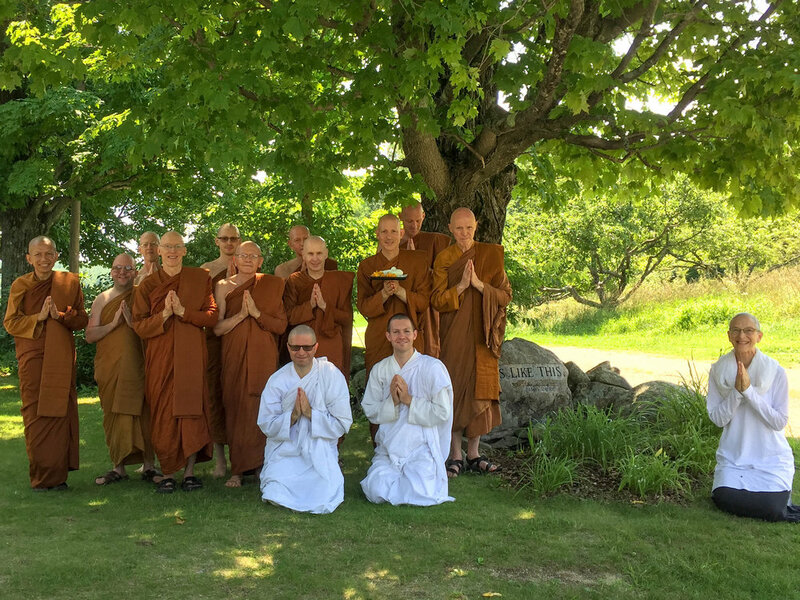 This year we were honored to host a number of visits from senior sangha members, including Ajahn Amaro in May, who officiated at a Visaka Puja (Wesak) Day Bell Dedication Ceremony, inaugurating the newly-offered monastery bell; Luang Por Liem and Luang Por Jundee in July, who likewise presided over a simple ceremony to inaugurate and bless the newly-offered Buddha-rupa (statue of the Buddha); and Ajahn Viradhammo, who came down from Tisarana in August to act as upajjaya (preceptor) for Samanera Santi (formerly known as Anagarika Michael) who became Santi Bhikkhu, and Anagarika Jeff, who became Samanera Jino. Anagarika Andy was given precepts in June. Each year since the time of the Buddha, at the end of the Vassa lay communities around Buddhist monasteries have gathered to celebrate its completion by offering to the resident sangha gifts of cloth, supplies, and other requisites that will be useful for the coming year. Some of the cloth offered on that day is cut, sewn and, if needed, dyed by the monks to make a robe on that day to offer to one of the monks who spent the vassa at that monastery. This 2,500-year-old tradition is carried on in the West in Theravada monasteries. The offering is initiated by a lay supporter or a group of supporters who request to organize the preparation and formal offerings. It is a significant and joyful occasion that, over time, has become emblematic of the richness of the relationship that exists between the lay community and the Sangha. This relationship is characterized by deep bonds of friendship and commitment to mutual support. All year round, the monastery functions solely on offerings from the lay community. Accordingly, people have been inquiring about what the monastery could presently use. For this, please check the Dana List. There are also building materials and larger or more expensive tools and equipment we can use to help with buildings and grounds maintenance and the continuing construction of kutis (small cabins) in the forest for use as traditional monastic dwellings. Please contact Ajahn Jayanto or Ajahn Caganando via the monastery contact address for any questions about these. So far over the past three years we have put up six kutis and one yurt, using a local contractor for five of the kutis. We hope to see you sometime at the monastery – do come to the Kathina if you are interested and wish to connect with the greater community as well as the sangha. This year’s Kathina will take place on Sunday, November 4. As always, everyone is welcome to attend and take part in the occasion. Organized by members of the lay community who wish to offer requisites and support to the monastery, this traditional ceremony serves also as an annual gathering for the lay and monastic communities and anyone who wishes to attend. Everyone is welcome to join us for any part of the day: an alms-round and shared meal, the Kathina Offering, a Dhamma Talk offered by Luang Por Sucitto (it will also be his birthday), and a chance to meet the sangha. From July 3–11 Temple Forest Monastery will be honored to host a visit by the abbot of Ajahn Chah’s main monastery in Thailand, Wat Pah Pong: Ajahn (or “Luang Por”) Liem. He will be accompanied by Ajahn Jundee, who was a young monk with Ajahn Chah and is now abbot of a well known monastery called Wat Pah Ampawan. Many of you may remember that Luang Por Liem and Luang Por Jundee were here for the monastery’s opening ceremony in June, 2015. They will be visiting Temple with a number of other monks after being part of the inauguration of the Reception Hall at Abhayagiri Monastery in California. Please join us to celebrate the visit of Ajahn Liem and Ajahn Jundee to Jetavana, Temple Forest Monastery, a Buddhist monastery in the town of Temple, NH. Ajahn Liem is the abbot of Wat Pah Pong, Ajahn Chah’s monastery in Thailand, Ajahn Jundee of Wat Ampawan. Ajahn Kevali, abbot of Wat Pah Nanachat, as well as other senior monks will be visiting as well. In honor of the occassion people will also be offering support to the monastery in a traditional offering ceremony called a “Pa Bah”. Everyone is most welcome to join in for any part of the day: an alms-round and shared meal, the consecration of the new Buddha-rupa (statue), a translated Dhamma Talk offered by Luang Por Liem, and a chance to meet the sangha. Bhikkhu Bodhi had been scheduled tostay at Temple from July 10–13, however due to a sudden death in the sangha affiliated with the monastery where he lives, has had to postpone his visit. This summer Ajahn Sucitto will be spending the Vassa with us, from July 27–November 4. King Memorial Tree Planting October 26, 1p.m. At 1 p.m. on Thursday, Oct. 26 we will hold a remembrance ceremony sponsored by our Thai supporters in honor of the late king of Thailand, H.M. King Bhumipol Adulyadej, who had ruled for 70 years when he passed away last year at the age of 88. 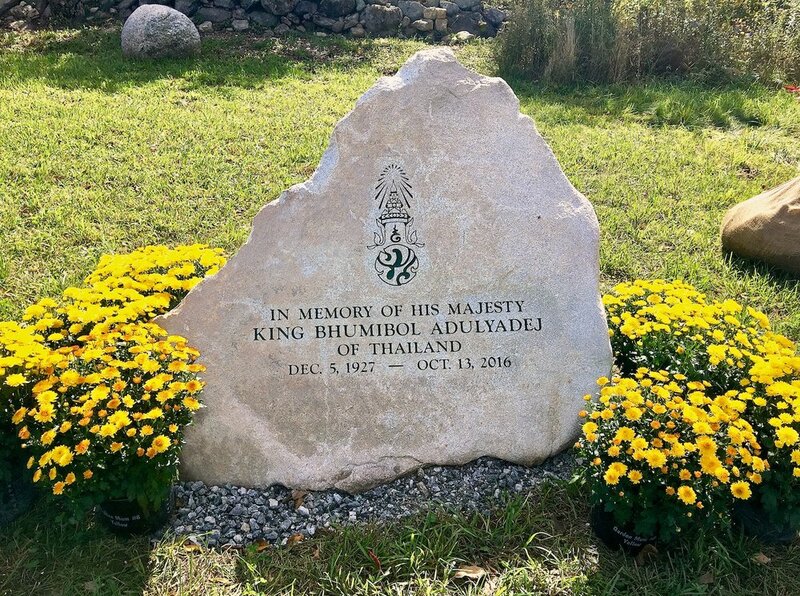 King Bhumipol was a revered and unifying figure beloved by the people of Thailand, and on October 26, the day of his funeral in Bangkok, the monastery will join with other monasteries around the world in planting a tree in his memory. All are welcome to attend. Our teacher and the founding abbot of so many of our monasteries, Luang Por (Ajahn) Sumedho will visit Temple from June 12–29, 2017. On June 25, some of our supporters wish to organize a Pa Bah (Offering Ceremony) in honor of Luang Por’s visit, and, as the central event, invite him to offer an afternoon Dhamma Talk. Everyone is welcome to come to the talk, to join in with the offering, or for any part of the occasion: an alms-round and shared meal, the Offering Ceremony, and the Dhamma Talk offered by Ajahn Sumedho. Luang Por Sumedho is currently visiting the monastery. He has been visiting some of our branches around the Northern Hemisphere this year, and we are honored to host him at Temple from June 12–29. Mainly this is a time for him to rest up and take it easy, and therefore he will be offering a limited number of Dhamma Talks and public visits during his stay, which we are arranging day by day as seems convenient. Therefore, if you wish to see him the surest day to do so would be on the day of our Pa Bah – Sunday, June 25 – when he will offer a Dhamma Talk between 12.30–2 p.m. (proceedings begin at 10.15 a.m.). Luang Por may offer Dhamma reflections at other times, such as on the Moon Days which fall during the period of his visit ( June 17 & 23) at 7 p.m. He will also likely come out to meet with visitors before the 11 a.m. meal on some days as well. Please call the monastery to ask in the morning on any particular day, as we may not know when he will do so until that day. A highly respected teacher will be visiting Temple from April 28–May 1: Ajahn Piak, an accomplished disciple of Ajahn Chah, will offer teachings on the weekend of April 29 and 30, including a public talk offered at 1 p.m. on Sunday, April 30 (in place of the usual meditation workshop). We expect that he will be available for questions and Dhamma conversation also on Saturday, April 29. He will be accompanied by four other monks, including Ajahn Issara Uttamacitto, and Ajahn Siripanyo who will translate from Thai to English. Please join us for this special occasion. Luang Por Piak is one of Thailand’s most respected teachers of Dhamma and meditation. Born in 1948, Luang Por Piak’s given name was Prasobchai but he was nicknamed ‘Piak’. As a child and young man Luang Por Piak did not have much interest in religion or meditation. It was when he was studying for his Masters in New York that Luang Por Piak began to develop an interest in cultivation of the mind. On the subway, for example, while heading to work, he would find his mind naturally observing and converging on his breath. There he found both pleasure and peace. He also noticed that he was able to wake up in the morning at whatever time he wished simply by mentally determining the time the night before. Even if he’d spent most of the night at a party, he’d still wake up exactly at the predetermined time. These experiences made him curious about how the mind worked and led on to an interest in meditation. After returning to Thailand, Venerable Piak then received full bhikkhu ordination from Luang Por Chah of Wat Nong Pah Pong Monastery on July 3rd 1976. In 1981, when Venerable Piak had been ordained for five years, a piece of property was offered outside of Bangkok for the establishment of a branch monastery. Luang Por Chah asked Venerable Piak to live there as the abbot. It was unusual for a monk to be asked to take on so much responsibility at such a young age, but Venerable Piak had had quick progress in his Dhamma practice and was also native to that region. Initially surrounded by rice fields as far as one could see, within ten years his small monastery had been completely engulfed by Bangkok’s urban sprawl. Noise, heat and pollution notwithstanding, Luang Por Piak has remained a refuge of peace and soothing coolness within the heart of Thailand’s largest city. His monastery is Wat Fakram (Wat Pah Cittabhavanaram) in Lum Lukkha, Pathum Thani, Thailand. Ajahn Issara Uttamacitto is a long-time student of Luang Por Piak and monk of 35 years standing. He is the abbot of a forest monastery outside of Bangkok and has traveled internationally as assistant teacher with Lunag Por Piak on many occasions. The Sangha at TFM for Vassa 2559/2016. From left: Anagarika Barnes, Ven. Sunyo, Ajahn Kancano, Samanera Candapanyo, Ajahn Anando, Ajahn Jayanto, Ajahn Caganando, Samanera Mejjho, Ven. Nyanasaro, and Anagarika Michael. Everyone at the monastery sends you warm greetings from Temple. It’s been another eventful year as we continue the gradual process of laying down roots so that Jetavana, Temple Forest Monastery may provide a place of training and spiritual sanctuary for many, long into the future. That’s the vision anyway, and the signs so far have been excellent. I hope you’ll forgive us for not posting or sending out much news on the website or to the mailing list these past two years. We are aware of and very grateful for the interest and support so many have shown to the sangha, including those of you unable to come physically to the monastery on a regular basis and thereby catch up with what’s going on. Here is a little summary of some of the recent, current, and future goings on. Luang Por Sucitto, beloved teacher and known to many here in New England where he has led many retreats and offered talks for decades, has just finished teaching a month-long retreat at the Forest Refuge in Barre, Mass. – and he is visiting us at Temple for the next two weeks. If you are interested in meeting him, the best time is, as usual, at and after the 11 a.m. meal offering every day, when he will usually be available to converse afterwards. Tomorrow (Sunday, Dec. 11) he will lead the weekly meditation workshop, and it is possible he will do so next Sunday (Dec. 18) as well. He will also give the Dhamma Talk after evening puja on the next full moon day, Wednesday, Dec. 14. Please feel free, as always, to join us for those occasions, or any day during Luang Por’s stay. He will depart for Canada in order to spend the winter retreat at Tisarana on Dec. 23. We will be honored to host our teacher and the founding abbot of so many of our monasteries, Luang Por (Ajahn) Sumedho for a visit to Temple from June 12–29, 2017. More information about his visit, and any public talks or teaching events, etc. will be posted closer to the time, probably sometime next spring. Some of our supporters wish to offer a Pa Bah in honor of Luang Por Sumedho’s visit, and, as the central event, invite him to offer an afternoon Dhamma Talk: that will be on Sunday, June 25 – so do book that into your calendar as it should be a special day. Another highly respected teacher will be visiting Temple next spring, from April 28–May 1: Luang Por Piak, an accomplished disciple of Luang Por (Ajahn) Chah, will offer teachings on the weekend of April 29 and 30, including a public talk at 1 p.m. on the Sunday afternoon, in place of the usual meditation workshop. More details about this event will be worked out and posted on the website closer the time. And on Sunday, October 8, 2017, Temple Forest Monastery will receive its first Kathina offering. 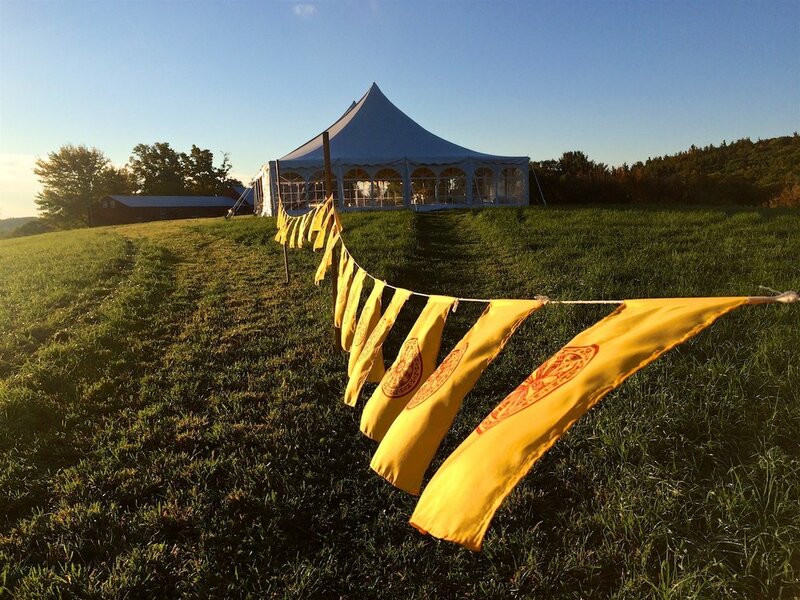 The ceremony will be attended by most of the abbots of the Ajahn Chah affiliated monasteries in North America, because we will also hold an annual abbots’ gathering here after the kathina. Luang Por Pasanno, Luang Por Viradhammo (who will arrive the day after the kathina), Ajahn Sona, Ajahn Punnadhammo, and Ajahn Sudanto will join us for the occasion (abbots of Abhayagiri, Tisarana, Birken Forest Monastery, Arrow River Hermitage, and Pacific Hermitage, respectively). The monastic community’s annual three-month Winter Retreat will take place from the beginning of January through to the end of March. This will be a period of silent retreat for the monks, with no short term overnight guests as well as no Sunday meditation workshops between January 1 and April 1. These three months of the year have come to serve an important function in our Western branch monasteries, with the traditional three-month Rains Retreat taking place in summer and fall which in European and American climates is often the best time to be active and working. Therefore the winter months of January, February, and March have become a time for the Sangha to put many activities down and have an extended period reserved for formal meditation practice. During the Winter Retreat the meal offering will be the same as ever: every day at 11 a.m. anyone is welcome to come to the monastery to offer (and share in) food to the Sangha. And while we won’t be accepting overnight visitors in the usual way, it would be helpful to have three or four laypeople stay at the monastery in order to support the monastic community’s retreat. Ideally these people will have stayed at the monastery before, and be able to stay for the full three months (or at minimum for one of the months). They would join in most of the group practice periods and there will likely be much unstructured solitary time to use to further one’s practice. Therefore they should be experienced in staying in a silent retreat atmosphere, and comfortable with solitude. If you are interested in supporting the Sangha in this way by helping with meal preparation, shoveling, cleaning, etc. from January 1–April 1, do send us an email. The long process of work on the lay guest accommodation building (the long red building attached to the barn) this year is coming to a close with only finishing work left before laying down tools for the winter (there will be some more to do next year). It seems that so many furry four-legged friends had been sharing the building with its human residents over the decades since it was constructed in the early 70s as an office building, that monastery guests could hear – and smell – this reality to the point it was becoming disruptive. Since we would not harm them, we attempted to convince them all to live elsewhere. This effort seems to have been successful (easy enough, during the warmth of summer). In order to prevent the rodents from returning we separated the building from the barn, and installed steel mesh around the base of the building, one foot up from the ground, one foot down into the ground, and one foot back under the ground. In addition we stripped out all the ceilings and insulation in the middle section of the building, installing a new ceiling and new insulation. This provides for three discreet sections: one for women, one for men, and one which can be for men or for women depending on need (and thus the new moniker “triplex”). We have been so generously offered so many free distribution Dhamma books to store for distribution over coming years, that in order to keep them safe from mold and damage the monastery purchased a shipping container, had it insulated, and built shelving to store them all. A little heater for the winter and dehumidifier for the summer should keep our Dhamma books in good condition for years to come. And, now that it has started snowing, we have embarked on the building of two more kutis (meditation cabins for the monks). Late last year, with a generous donation we were able to build one. Further generosity received over the last year or two from supporters in the UK provided for the construction of another kuti this year, but the contractors involved could not start until a couple of weeks ago. And as a result of the offerings received at this year’s Pa Bah (held here at Temple on Sep. 18) we are able to build a third kuti: the monks are helping a carpenter friend currently working on it with another friend, Bob Berube, who is volunteering his valuable help on most days. The resident sangha here at Temple is currently five monks (bhikkhus) two novices (samaneras) and two postulants (anagarikas): Ajahn Jayanto, Ajahn Caganando, Ajahn Jivako, Tan Nyanassaro, Tan Sunyo, Samanera Candapanyo, Samanera Mejjho, Anagarika Barnes, and Anagarika Michael. Next year Ajahn Anando, who was with us again this year for the Vassa, will return to Temple for another extended stay in June 2017. Hopefully we’ll be a bit more regular with our website/mailing list news updates next year too.